Filmfare is one of the biggest awards night of the B-town. After all, we get to see all our favourite celebs coming under one roof for a night full of entertainment. Not only do our celebrities are awarded for their extraordinary work, but we also get to see some amazing performances. It is when celebs take over the stage and dance to some great songs. Usually, we don't see celebrities dancing to the songs from other's movies but with awards night like these, there is a chance to see that too. This year, Filmfare celebrated its 64th edition. Young stars like Vicky Kaushal and Janhvi Kapoor gave some great performances at the stage. Janhvi can be seen dancing in a pretty pink blouse and skirt as she tries to recreate Deepika's Ghoomar. The video also shows the Janhvi's dad Boney Kapoor and sister Khushi Kapoor cheering for Janhvi from the audience. 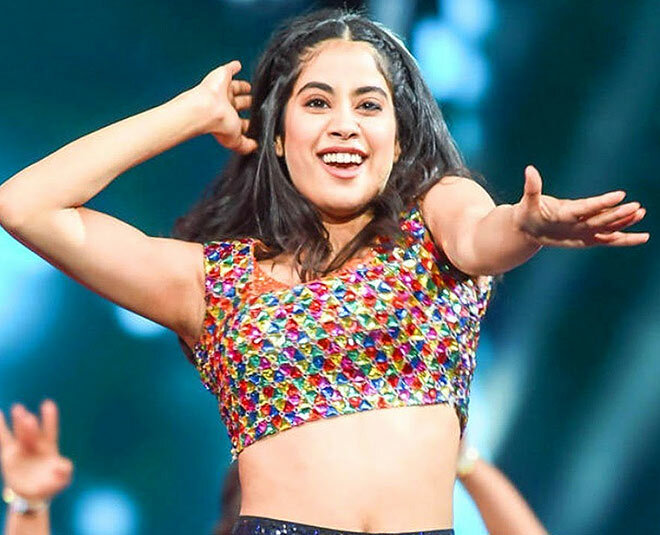 Janhvi's rumoured boyfriend Ishaan Khatter is also seen cheering for Janhvi as she dances to Kamariya from Stree. The Filmfare Awards also paid a special tribute to Sridevi. She was given the Lifetime Achievement Award. Boney Kapoor, Janhvi Kapoor, and Khushi Kapoor were seen receiving the award on her behalf at the stage. Sridevi's death last year was a big shock to the entire nation. Karan Johar presented this award to the Kapoor family. On the work front, Janhvi is prepping for her next where she plays a female pilot. She will be playing the role of Gunjan Saxena who was the first female pilot of Indian Airforce. She will soon be taking flying lessons at the Indore Flying Club. Actor Angad Bedi will play Janhvi's brother in the movie. Janhvi will also be seen in Karan Johar's multi starrer, Takht. The movie also stars Ranveer Singh, Alia Bhatt, Kareena Kapoor Khan, Vicky Kaushal, Bhumi Pednekar and Anil Kapoor.